In one of the book clubs I am in (the only one that meets in person), we met to discuss The Elegance of the Hedgehog by Muriel Barbery, translated from the French. It takes place in Paris, where a concierge named Renee tries to keep her intelligence hidden from the people living in her building. Along the way her friend Manuela is always bringing her baked goods, and while this is a minor plot point, I decided to dig one up to try making for tonight. The baked good getting the most attention in the book is a gloutof, which is described as "a rather voracious Alsatian cake." Despite my doubts that a cake can indeed BE voracious, it intrigued me. I had definitely never heard of it. From page 262 of the paperback: "But Manuela's gloutof is ambrosia as well. Everything that is dry and heavy about Alsace is transformed by her hands into an aromatic masterpiece." Later in the story, Manuela's gloutof gets devoured with coffee while watching a movie. I tried looking up a recipe for a gloutof on the internet, which usually would not fail to produce recipe after recipe for most breads or cakes. The only references I found were related to the book I had read, including a blog post that had found reviews of the original French book that said the author meant to say kugelhopf. I would be more than happy to entertain proof of an actual item called gloutof, but for now I elected to go with the wisdom of the masses and make a kugelhopf instead. I found a recipe from Dorie Greenspan in someone's blog, although I'd urge any reader of this blog to purchase her cookbook "Baking From My Home to Yours," because it has everything in it, even apparently obscure baked goods I only learn about through literature. 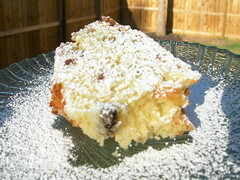 A kugelhopf is pretty much a brioche, somewhat cakey, with raisins that I soaked in kirsch instead of water, since another recipe I found had that advice. I had a disaster trying to get it out of the pan because alas, I do not own a kugelhopf-specific pan! But it still tasted good, and will be just as good toasted and spread with jam in the morning with a strong cup of coffee. By the way, The Elegance of the Hedgehog is an interesting read. At first my reaction was mixed, but it is one of those books that seems to improve after I've thought about it for a while. I finally talked my group into reading something post-apocalyptic, so who knows what creations that might inspire! When I saw this challenge I was pretty excited, since it would be a new skill for me. 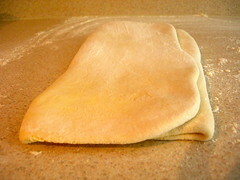 Puff pastry is one of several kinds of laminated doughs, which is a dough layered with dough and butter. I have not yet attempted croissant dough, but have tried danish pastry before. I almost signed up for the puff pastry class at the local community college, but after inquiring, discovered they were starting with pre-made dough, not teaching the making of the dough, so it was high time! I decided to make savory and sweet vols-au-vent, and made a fresh tomato-mozzarella-basil-balsamic salad for the savory ones. The vinegar was a nice contrast to the extreme richness of the pastry. Puff pastry is a yeastless dough that you wrap around rolled out, chilled butter. There is a lot of folding and rolling but the butter absolutely must be cold or it will ruin the layering of the final product. I'm not sure I always had it right, and actually pulled a muscle in my forearm rolling out the 5th time or so. But my butter was definitely kept cold! It was funny that this month's challenge was from a Julia Child cookbook, because I've been on a Julia Child recipe baking and cooking binge for several months. 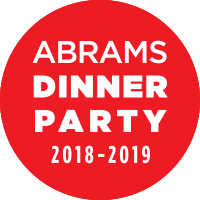 I'm about ready to put that trend on hold - the food is all good, but so, so rich. But to celebrate this last phase of Julia Child, I made her mousse au chocolat, or chocolate mousse, from her now infamous cookbook, Mastering the Art of French Cooking. So many chocolate mousse recipes that I have found are basically a chocolate whipped cream, but this is the classic recipe using eggs, and is spongy (in a good way), ethereal, and deeply chocolatey. I even found an old blog post where David Lebovitz blogs it as his standard chocolate mousse recipe. 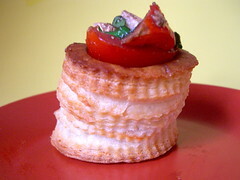 It is worth a try, and inside a homemade puff-pastry vols-au-vent, it was a rich treat. A few days later, I still had half a recipe of puff pastry to use. 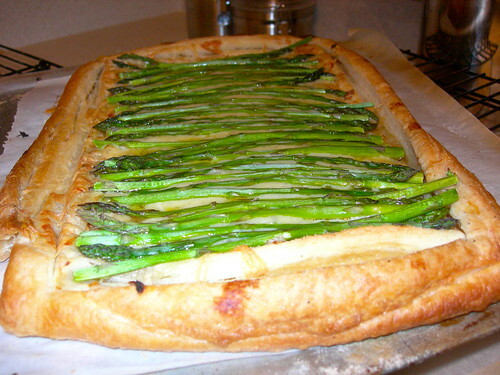 I scoured through cookbooks and cooking blogs, and came across a recipe on Zoe's blog for an Asparagus and Gruyere Tart. I couldn't imagine a better use of it, and it was very delicious. So, is it worth it to make puff pastry from scratch? I found the results to be buttery and delicious, beyond the taste of anything I've found at the store. It isn't a recipe that takes a lot of devoted time, but you do have to plan ahead to allow for all the turns and butter re-chilling in between steps. As for me, I'm ready to turn to some less rich recipes for a while, but I never know where the Daring Bakers will take me! I haven't blogged much about baking lately because I haven't done a lot of it! I did manage to still make some cookies for my student workers, and the chaos of the beginning of a busy school year seems to have balanced out to a more even gallop now. 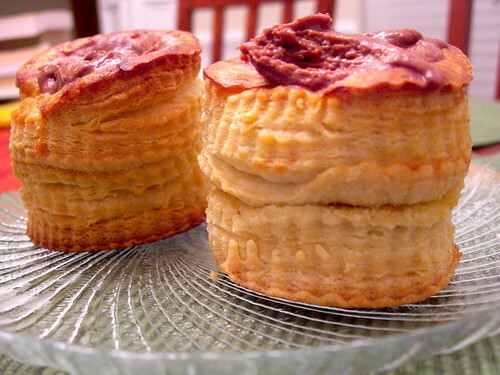 This is a recipe I found on VeryBestBaking.com, it looks like it was a winning recipe submitted by someone out there named Lee. I wanted to make peanut butter chocolate chip cookies and when I saw the dough was both peanut butter and chocolate I knew I had to try them. They were good. For them to be great, they should have half as much salt. 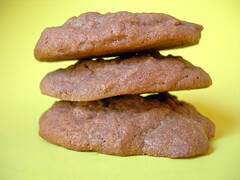 That's the only change I'll make for next time, although I also substituted half margarine for the butter, since I have found that makes a softer, chewier cookie, which happens to be my taste.